Capsule Summary: Father Mulcahy saves the day after black marketeers steal the 4077th’s penicillin. 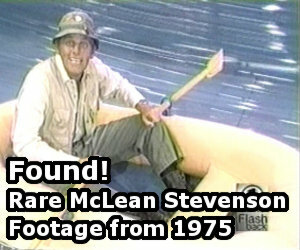 It’s not often that an episode of M*A*S*H surprises me, given that I’ve seen them all many times. But this one did. I was ready to write off Major Ross as just another buffoonish foil for Hawkeye because I had completely forgotten how the episode ends. Having Ross turn out to be a nice guy (and seeing Hawkeye get his comeuppance) made rewatching this episode more fun than usual. Still, I wonder if most viewers watching “Tea and Empathy” for the first time felt the same way I did, that Major Ross was too exaggerating to be taken seriously. Although he’s ultimately redeemed, was his first appearance too much bluster and brimstone? Father Mulcahy is often at his best when he actually has something to do and he certainly had something to do here. It’s always fun to see the 4077th’s man of the cloth as a man of action but it wasn’t very believable that none of those bullets hit him or Klinger even if the black marketeers weren’t actually aiming for either of them. I doubt they were sharpshooters who could hit the jeep so accurately. I didn’t actually time out how long they were both on screen but it felt to me as if Hawkeye took something of a backseat to B.J. in this episode. Was this the only episode to feature a patient addicted to morphine? There was a tremendous amount of drinking on M*A*S*H but very little drug use. Margaret and Charles were little more than an afterthought here. This was one of several Season 6 episodes that seemed to be pushing the two towards a romantic relationship, although that may be reading too much into things. “Tea and Empathy” was the 17th episode of Season 6 to air but was actually produced ninth so the writers were still getting a handle on Charles. At this point he was pompous and snobbish and little else. Radar is not in this episode. The British unit in this episode is the Gloucestershire Regiment (known as the Glosters). They were earlier referenced in “Smilin’ Jack” during Season 4. Sal Viscuso, who played Corporal Benny Bryant in this episode, was one of the uncredited voices of the PA on M*A*S*H. This was his third and final appearance on the series; his previous guest appearances were in “Dear Sigmund” and “Post Op” (both during Season 5). According to Jay Pirelli’s Internet Movie Database profile, his only acting role was in this episode. He played Michaels, one of the British soldiers. This is a so-so episode for me: it’s not that it’s a bad episode, but rather, as I’ve mentioned before (and I apologize that I keep drudging this up), from 2006 to 2007, I suffered with my second and longest (and thankfully last) bout of clinical depression, and for some reason, I don’t know, I watched this episode a lot during this period, so now whenever I watch it again after all these years, it makes me feel uneasy because it kind of serves as a reminder of that dark period of my life. Chris Mulky appears in this episode as the wounder soldier Charles and Margaret look at in triage: he would be much too old now, but I often thought had they ever done a movie remake of M*A*S*H (perish the thought) that he would make for a good Frank Burns – he bore resemblance to Larry Linville, and I’ve seen him play weasely jerks before, so he probably would have been good in the role. Now then, I’ve brought this up before and have never gotten comment on it, so has no one else besides me noticed that the schoolhouse Klinger and Mulcahy go to has been recycled to death? In “Bug Out” it was where the concubines lives when the 4077th was going to set up a new hospital; in “Hawkeye Get Your Gun” it was the South Korean hospital Hawkeye and Potter went to; in both parts of “Comrades in Arms” it was an abandoned schoolhouse Hawkeye and Margaret sought shelter in; and in “Out of Gas” it’s where the black marketeers Charles and Mulcahy did business with were headquartered. Even in “Point of View,” as Rich is being transported to the 4077th, you can see the facade of this schoolhouse actually sits on the dirt road that runs just north of the 4077th compound. 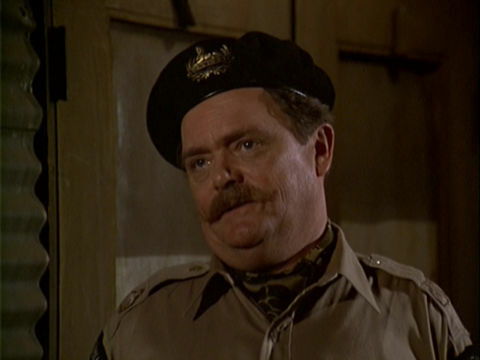 I also forgot to point out the interesting choice of Bernard Fox as a guest star in this episode, as he was a semi-regular on M*A*S*H’s preceding rival sitcom, HOGAN’S HEROES, in which he played the bumbling RAF Colonel Crittenden, who often bungled the Heroes’ crazy schemes whenever he got involved. Bernard Fox was quite the prolific character actor back in those days, he was a semi-regular on a number of shows, including THE ANDY GRIFFITH SHOW as gentlemen’s gentleman Malcolm Merriweather, and my favorite role of his as the quacky Dr. Bombay on BEWITCHED. Bernard Fox was an awesome Dr. Bombay!! I loved his appearances except the episode with the giant bird. This is a great episode but then again, this is from Season Six which had all the awesome episodes. Just heard about Bernard Fox’s death. I thought he did a great job in this episode. And, with a nod to ” Bewitched” , Dr. Bombay will see you now. This was an OK episode for me too. The switch ending was clever too. It’s kind of odd to me that in the beginning, I wondered if Major Ross was doing exactly what it was revealed he did. In a way, he told his men they’d be ready to go back to doing their jobs soon which was telling them they’d be alright soon, then in the end he spends time with his men sharing mail. This officer actually did care about his men, just as much as Hawkeye did. At least there wasn’t too much preaching this time. Good episode, I actually like the subplot with B.J. helping the morphine addicted patient clean up his act most of all.